This promises to be a significant experience, bearing in mind the timing of our visit. Our leader rises to the occasion and is full of information, anecdotes and good fellowship. Enhanced security is most obvious. We have to leave all bags, camera cases – even bum-bags – behind in the bus, which unlike that on Maui, is full. The twenty-minute introduction and film are very well done. The introducer, like our guide, refers to the attack on the World Trade Centre and the correlation between the two is getting easier to understand as the story of Pearl Harbour unfolds. The film is the original black and white and a bit crackly, but most interesting and moving – I guess the more so because of recent events. Then, they were prepared for sea attack, but were surprised from the air. I have the feeling of history repeating itself. 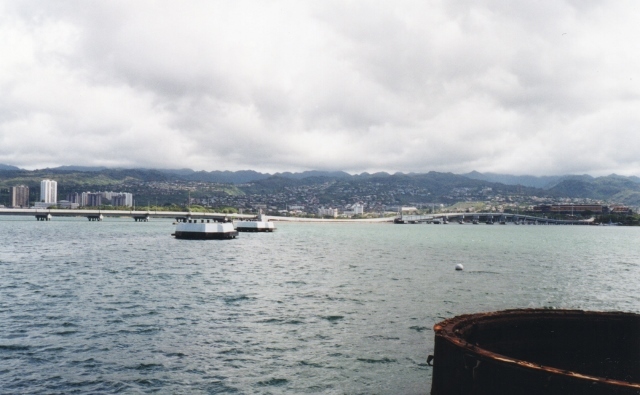 The Memorial lies directly over the sunken battleship. We are transported there by boat. Some people scatter leis over the waters. Fish swim over and round the rusty bits of iron peeping above the clear waters. Oil still escapes, and grows in colourful patches over the water. So many people (over 1000) remain here under the waters. It is moving knowing I am actually standing here, and they are still beneath me. I wonder if the US will have a memorial for the World Trade Centre. The message, for me, is one of sadness for the world; we will never learn. Afterwards, we are taken on a tour of Honolulu, Chinatown, civic buildings and the old palace. Then we drive nearly 2000 feet to the top of a hill to view Honolulu in a wide vista, and I am able to identify several places. Pearl Harbour lies in the centre of the right hand picture. The sea is a deep deep blue, and skycraper hotels dominate the waterfront. In the evening I experience another facet of this amazing place when I join a group for dinner and dancing on board the Ali K’ai catamaran and watch the sun set over the Pacific. What a joyful, happy crowd we are, our leader aloha-ing with great gusto, and taking us along with him. Our hosts perform some beautiful dances, and get most of us to join in. I cannot do justice to their buffet, however, as I treated myself to late lunch sampling traditional Hawaiian Lau Lau (pork, baked in taru leaves), but I do not like their poi (remember to pronounce every vowel separately: I call it Poo-i). I get back to my hotel barely in time to change into warmer trousers and take the transfer bus to the airport to catch the plane for Aukland. More security measures, and a very long wait before we finally take off at about 1 a.m., when I have another dinner. Breakfast is seven hours later after a stop in Fiji; we all have to get off the plane, go through physical bag checks, and then get on again. And I’ve now lost a day. This entry was posted in Travels and tagged Ali K'ai, Chinatown, Honolulu, Lau Lau, leis, Pearl Harbour, poi, World Trade Centre. Bookmark the permalink.